What's the difference between Twitter Live and Periscope? I see the camera button beneath the cursor when I open a window to tweet. And the latter, which Twitter acquired in 2015, is installed on my iPhone – still waiting to be loved. But shouldn't they be doing the same job, allowing smartphone owners to live stream any time anywhere and get instant feedback? I have another important question. Is anyone regularly using these tools beyond early adopter types, X Factor hopefuls and wannabe celebrities? Who are the must-follow live streamers? How is the company working to nurture its broadcaster community, one that has been largely underserved as this Mashable article explains? And what about Facebook Live, Instagram Live and YouTube Live? Everyone is going live. Where does Twitter fit in? Only one place to go for answers and that’s London HQ, of course. 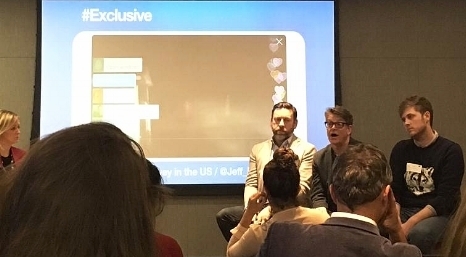 There, among a small industry crowd, I was given a short presentation about the different ways that people are harnessing the service, from popular individuals like Emmy Award-winning storm chaser Jeff Piotrowski to power publishers like Buzzfeed. Our host also gave us a glimpse into the future. One key update was that Twitter plans to combine Twitter Live and Periscope to create the go-to live broadcast platform, one that can be accessed and navigated in as fewer clicks as possible like Snapchat. A sensible move for a company that wants to be what’s ‘now’ (or rather “what’s happening in the world and what people are talking about right now”). Although it’s important to appeal to the general public, both in terms of deepening the pool of available streams and clocking up viewers to woo advertisers, it is clear that brands are also key targets for Twitter. This is a business, after all. Hence the recent launch of Twitter Studio for publishers. Jo Kelly, Twitter’s Head of News EMEA, said that, “The priority is working with news organisations to monetise their content, taking clips from their live streams to market.” This could be in the form of breaking news (Bloomberg is a partner), pre-planned events ( eg Live Nation concerts and Wimbledon) or special programming (Gatorade's #TheBuzz and PopBuzz). According to their Q4 2017 shareholder letter, Twitter live-streamed more than 1,140 events (up from 830 in Q3) and made 22 new partnerships (nine of which were international). It will be interesting to see how the interests of consumers and brands each impact product development. McHugh is a veteran of mobile journalism. He noted that live broadcasting has been around for a long time. In fact, I have covered pioneers such as Tim Pool and the rise of smartphone-wielding citizen journalists on this site. But the ability to upload content on site, in the midst of a story, is now greater than ever, especially for those working on investigations. One caveat though: he was quick to emphasis the value of personality and insight when live-streaming, particularly if you hope to make money from it. Otherwise you risk undermining your brand. “When you watch live, the picture can be shaky, noisy but people want to stay with it to see what happens. But if you are live you need to keep it engaging, explain what’s happening…” And your audience can help you do that by asking things you haven’t even thought of. It's not all about flying hearts. Broderick is an engaging presenter/commentator. He has live-streamed reports everywhere from pro-union protests in Barcelona to North Korea demonstrations at the Winter Olympics. For him, Periscope is “an incredible opportunity to get right in there.” But it goes beyond that. Buzzfeed is still fighting for credibility in the media industry. “We really want to showcase that we have reporters and they know things,” he said. However, he was concerned about the issue of consent as you are putting people live on camera like never before. Overall I did come away with more questions than answers, many of which Hansen echoed. For instance, how is Twitter going to verify and manage all this user-generated content? Streams could easily be misleading – “context isn’t always there with live,” as he put it. One solution could be to aggregate several feeds/cameras from one event or scene. Safeguarding is also important. Remember last year’s stories about viewers grooming children on the platform? But let’s finish on a more optimistic note. Well, two actually. Personalisation is always a big carrot for users. So imagine if Twitter could recommend the best content for you using machine learning. That would be invaluable. Secondly, Hansen anticipates a new realm streaming-inspired documentary. “Where could live video go next?” he asks. “What can that bring us in terms of understanding what’s going on in the world and our enhancing our empathy? Let's get out there and find out.